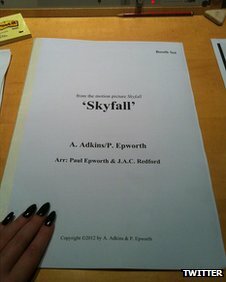 British super-crooner Adele confirmed via Twitter that she has recorded the theme for the upcoming James Bond installment, Skyfall. The Rolling in the Deep singer posted a photo of the song credits on her Twitter page. The confirmation comes after months of rumors she would lend her talented vocals to the Bond pic. In the past, Sony Pictures, which releases the Bond movies as well as Bond production company Eon Productions jointly announce who will perform the theme song, but this time around Sony repeatedly declined to comment on who would be doing the song, according to BBC. The image appareling on Adele's Twitter page lists composers as A. Adkins, her full name as well as P. Epworth, the producer and co-writer of her Rolling in the Deep hit single. Epworth and film composer JAC Redford arranged the music. Redford's credits include The Help, The Iron Lady and Wall-E.
She danced around the speculation she'd sing the song for Skyfall in September 2011 during an interview on Britain's ITV1, saying, "I'm going back in the studio in November, fingers crossed…Well this is actually a theme, what I've got to do for, um… Wow. That's really giving something away isn't it?" The song, Skyfall is the first to have the same name as the film since Madonna's Die Another Day in 2002. The 23rd installment of the James Bond series opens November 9 in the U.S. I want to suggest you few interesting things or tips. Perhaps you could write next articles referring to this article.